One of the most important lessons we share with our students is the value of collaboration. Aaron Scott’s industrial design and communication design students do that in class, but they also get out of their “silos.” When I talk with Aaron, his passion for teamwork is evident. Aaron, an assistant professor of design, joined the faculty in 2009. He earned a bachelor of fine arts degree in three-dimensional design from Weber State University, and a master of fine arts degree in industrial design from Purdue University. Aaron’s students benefit from his varied background, which includes product design and sales and marketing. Industrial design, he explained, is more product and service-oriented, while communication design involves more visual communication and interaction. The students in his senior-level industrial design class are preparing to compete later this month with teams from other universities for “Best in the Midwest Bragging Rights” during an event sponsored by the St. Louis chapter of the Industrial Design Society of America. Their task is to come up with an innovative way to improve access and the experience of people with disabilities in the workplace. They are shadowing two disabled individuals to better understand the challenges they encounter. 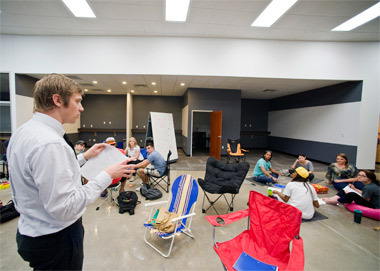 I also appreciate the collaboration of Aaron’s graphic design class with MBA students on game development. His students will create a product, and the MBA students will develop a marketing platform for it. They then will launch their creation through the online platform Kickstarter. “These are not just fun games, these are games that address social problems, games that tackle more serious issues, or even training exercises for individuals,” Aaron said. Later in the semester, his students will partner with electrical engineering students to learn basic programming. “We want to use our expertise, combined with other people’s expertise, to create systems that solve problems,” he said. With his private sector experience, Aaron understands the demands of the workplace. He wants his students to be prepared. I am impressed, also, by Aaron’s mentoring, and that of fellow faculty members in the School of Art and Design. Their efforts extend beyond academics – even making sure students are eating breakfast. That’s what we mean when we talk about the brains and the heart of SIU.